A Thrilling Vintage From the Master: Does Wine Get Any Better Than This? Does Wine Get Any Better Than This? Caught your attention didn't it? Well you read right. 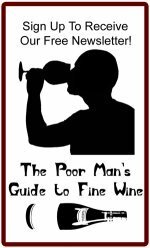 I honestly feel that these wines that are right at home in the Poor Man's Guide to Fine Wine deserve a place alongside wines costing ten times as much. 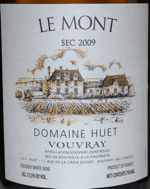 I have made no secret of my admiration for the wines of Domaine Huet from Vouvray in the past. To get caught up on the domaine, the vineyards and the wines from the 2007 vintage, check out Issue 15. Lets get right to the money issue. Twenty five to thirty dollars a bottle is not cheap. Most of us can't go out and buy cases and cases of these wines. But make no mistake, at the quality level these attain, hundreds of dollars a bottle would be worth it. There are Montrachet sold every day for hundreds of dollars a bottle that pale in comparison to these wines. In that context, these are massive values that shouldn't be missed. Huet does make more expensive wines. However, they are not necessarily "better" wines. The most expensive wines in the lineup are the sweet, dessert styled wines. They are made from very late harvested grapes and only the best clusters or grapes that have the most botrytis are kept. Therefore, less of these wines are made. The top of the heap, the Cuvée Constance, can fetch hundreds of dollars a bottle. Is it good? Oh yes! It is breathtaking. But it is not a wine for everyday, it is not a wine for every situation. It is a very sweet, rich, thick and complex wine that can age for centuries. Does that mean it is qualitatively better than the dry wines? No. The sec wines come from the same great vineyards and are produced by the same winemaking team with the same attention to detail. They are stylistically different than the sweet wines, but no less stellar in quality, personality, character and complexity. More of them are produced, so the prices are lower. Good for us! Domaine Huet is the kind of genius wine producer that can produce great wines in just about any vintage. I never hate their wines. I never even mildly dislike their wines. Some are better than others, but they are always worth buying and drinking. However, occasionally a vintage comes along that just has everything going for it, where a producer just hits it out of the ballpark. I thought the 2007's were about as good as Vouvray can get. I scored them very highly and bought them up for my own cellar. I didn't expect that just two years later would come along an even better vintage. But I have to admit, that as great as those 07's are, the 09's are just a notch up further in the stratosphere. Detailed notes of the three sec wines can be found below with the other wine reviews. In general, they follow the same progression and have the classic characters that you find in these three vineyards from year to year. 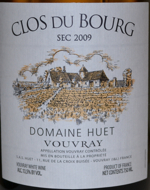 However, whereas I often find that there is a steady progression from the Le Haut Lieu up to the Clos du Bourg, this year it is very difficult to say that any one is better than any other. Make no mistake, they are quite dramatically different wines! They are not just three good clones of each other. Each has their own unique and powerful personality. While I usually say that, as great as the Le Haut Lieu is, the Clos du Bourg just has even more elegance, depth, complexity and ageworthiness, I can't say that this year. To say one is greater than the other feels like I'm being disloyal to the other. They are all truly great wines and at the pinnacle of what Vouvray can attain. As it usually is, the Le Haut Lieu is the most approachable now, with a shimmering, vibrant, succulent and seductive character that is heavily in the citrus camp in terms of its acid backbone. 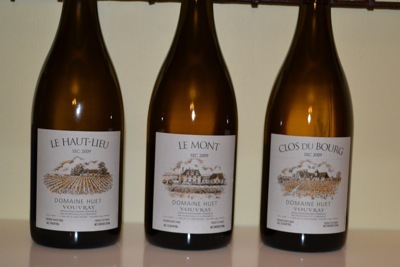 The Le Mont and Clos du Bourg are more mineral, like hewn rock, dark and from the earth. They almost seem like they couldn't have possibly come from something living, from a fruit nonetheless. Whereas the dense core of Le Mont is more igneous, chunky, almost a bit rustic in comparison, the Clos du Bourg is regal, fine, etched like the finest Michelangelo marble statue. These are wines to write home about. They are wines to learn from. They are wines to learn about the soul of Vouvray from. They are wines to learn how a wine can live and breath, can have a life and personality all its own. They are wines to learn about the influence of terroir (these are all 100% Chenin Blanc). These are wines to cellar and learn about how wines age. These are wines to drink and to love. 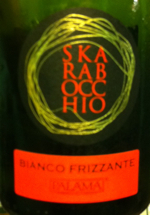 This is an Italian sparkling wine, a frizzante, which is usually less bubbly than Champagne, a fresh and refreshing wine. I bought it because I wanted something to go with spicy Indian food and thought this might have a bit of sweetness to it. It turned out to be pretty dry and didn't go well with Indian food unfortunately, but it was still a very nice wine. The fruit is decidedly more fruity and citrus than a Prosecco, with a hefty dose of orange and orange zest in the nose and flavors. It is only very slightly off dry and tends more to the crisp, fresh and aromatic side. The citrus acidity and chalky minerality are very pleasant. This is a great option for a refreshing sparkler but not for spicy Indian food! One Star Plus. This one is another sparkler but from Argentina and made from Malbec, which is widely planted in the area. Most of it goes into rich, structured red wines, but this is a slightly sweet rosé sparkling wine. You can definitely smell the Malbec in there, with cassis fruit, a pencil lead minerality and a smokiness. In addition to that, its got a sweetness to it, fresh strawberry fruit. This is sweet but far from a dessert wine. It is simple but fresh and easy to drink and did go well with spicy Indian cuisine. One Star. What this has going for it is its typicity. From the first smell, it is quite clearly Macon Chardonnay, with its white stones and white peach with crisp minerality making an appearance. It couldn't be a California Chard. What it doesn't have going for it is complexity. It is a rather simple wine, but don't read that to mean it is light or vapid. 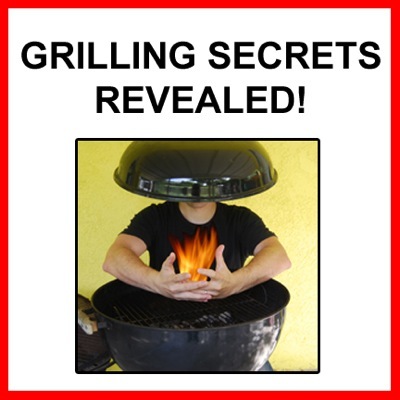 It does have some body to it and is flavorful, its just that those flavors are simple. It is crisp and silky and for an inexpensive white Burgundy, this won't disappoint you. One Star. 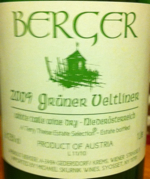 This Gruner comes from a respectable producer in Austria and is in a big 1 liter bottle with a crown cap. It doesn't look impressive, but what you get in the big bottle for the meager price is impressive. A very fresh and pure wine awaits you. Piney citrus fruit aromas and flavors are presented in a very pure, classy style that is simple and straightforward. Again, this is not a super complex wine, it isn't a wine to sit by the fire and contemplate for hours. But it is very GruVee and, as most are, it is very food friendly and supremely refreshing. The big bottle and low price make it easy to stock up on this and have it around as your house white. This is a no brainer. Keep a few in the fridge! One Star Plus. 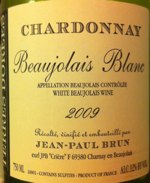 You don't seem much Beaujolais blanc around. In fact, most people pretty much exclusively think of Beaujolais as a red wine. And 99% of the time you'd be right. But a bit of white wine is produced here and this one is made from Chardonnay. The interesting thing is that despite being a totally different grape (red Beaujolais is made from Gamay) and color than most Beaujolais, this tastes like Beaujolais! My wife doesn't typically like Beaujolais much, there is something in there that doesn't agree with her taste chemistry. I served her this blind and she said she didn't like it because it reminded her of Beaujolais! The nose has some typical stoney Burgundian Chardonnay fruit. In the mouth it is rounder and juicier than Chardonnay from its northern neighbors. But on the finish is where you really get a juicy fruit character which is similar to some lighter Beaujolais reds. For me, this is more of an intellectual curiosity. It is unique and has transparency to its underlying terroir. Is it my new favorite white? No. But its worth it for the unique and fun experience. One Star. This is an interesting wine in that it comes from a little known appellation in the Loire Valley from a grape that is not known to many in the states. It is made from Romorantin which is actually a cousin of Chardonnay and produces a crisp, mineral wine. This example shows a bit of age already with a bit darker color and some butterscotch and honey on the nose. Not overtly oxidized but definitely showing a bit of age. It has a fine minerality that is silky and filigreed. Definitely a mineral wine that is akin to Savennieres and Chablis in terms of its intensity, although with just a hint of residual sugar. Although it shows some age, this isn't terribly complex. The pink grapefruit, peach and mango flavors have a hint of a bitter peach pit austerity to it. It lingers in the mouth for a long time. All in all, this is really interesting and approachable right now and has the elegance and stature to be great. But the notes hinting at oxidation are a bit concerning for the future. Right now its very much alive and a very pretty wine. However, I'd be concerned to hold on to it for a long time. It may get more oxidized and die, or it may gain in complexity and be even better. Two Stars for now. What the future holds is anybody's guess. If you've read the Poor Man's Guide to Fine Wine much in the past you'd know that I'm not a big fan of most California Chardonnays and don't drink them often. I too often find them too ripe, too alcoholic, too oaky, too flabby, too everything. I tend to like wines that are the opposite, firm, balanced, pure, mineral and crisp. I received a bottle of this wine as a gift and was skeptical to say the least. I'd heard of the producer and knew this wasn't cheap. I was mostly expecting to find an over oaked, over hyped wine. Wow! I couldn't have been more wrong! Frankly, this is my favorite California Chardonnay I've had in a very long time. It is DIA-metrically opposed to most Cali Chards. I don't know what the oak treatment is here but it is very subtle and well integrated. Instead, in the nose there are refreshing and fine aromas of grapefruit, grapefruit seed and a chalky minerality. This is not diffuse and alcoholic like many Chards, rather the aromas give the sense of freshness, brightness and a crisp, driven wine with energy. Served blind, I just might be fooled into thinking this was a Chablis or something along those lines. This speaks much more of the vineyard and the fruit than of the winemaking and the oak. Bright and intense flavors are just great. It is full bodied with ample ripe fruit flavor, but compared to most Cali Chards it is downright austere, vibrant and intense. It doesn't quite have that dense core of granite and oyster shell you get in the best Chablis or Muscadet, but it is leaning toward that, certainly far more than you get in most New World Chardonnays. While there is a fruitiness, it is more on the fresh, citrus end of the spectrum, not the flabby overly ripe tropical fruit end of the spectrum. If you love typical California Chardonnay, this may not be your bag, but if you like French whites and appreciate subtlety, finesse, balance and freshness in your wines, this may surprise you. Will it age as well as a white Burg? Who knows. It doesn't have a track record to say if it will last or improve, but I'd be willing to bet it will last and maybe improve over several years. Two Stars Plus. This is a blend of Italian grapes, Uva Rara and others. A rather ripe nose that hints at citrus leads to a round, almost waxy textured wine. But despite that mouthfeel, it has a bright acidity of grapefruit. There is a hint of sweetness to it as well that adds complexity and evokes thoughts of a grapefruit punch or tangy lemonade. This is pretty and refreshing. One Star Plus. Compared to the Le Haut Lieu, the Le Mont is much deeper and darker, more brooding and closed up at first. Compared to the fresh fruit and citrus of the Haut Lieu, this is boasting a dark rockiness, evoking images of igneous rocks. 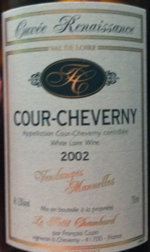 It is quite closed up and less flashy, showy and accessible than the previous wine. But in the mouth, this is massive, a big dense wine with dark depths to search. Austere and fully big chunky rock minerality. This is not nearly as succulent and flashy, this is going to need time to unwind. This is really powerful stuff. It has every bit of the complexity, finesse and regal stature of the Le Haut Lieu, it is just a very different expression, which is typical for this vineyard. Whereas the Haut Lieu is clearly sewn from fruit, this is "of rock". Like you took a mountain and pressed it and tiny drips of this came out. The texture is fuller and thicker, but every bit as shimmering and intense. This is great now, but 5 to 10 years will easily be needed to start to be in top form and will be almost indestructible after that. Three Stars. What more can I say? 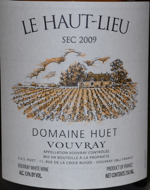 This is yet another brilliant wine from Huet, completing the stunning trio of Secs from 2009. It has more in common character-wise with the rocky, earth based Le Mont. But whereas the Le Mont was almost rustic in its burly, igneous rock type of minerality, this is more refined, like finely etched granite, making it just a hint more regal and sophisticated. Like the Le Mont, this is quite wound up with intense nervous energy at its depths. It is remarkably balanced and refined at this point, but it will only improve with lots of time. Five to 10 years will do it well, but you may find, if you have the patience, that this is only really hitting its stride in 30+! Overall, this takes the elegance and finesse up a slight notch, but that is really just a difference in its character. Can I give Three PLUS stars? To say any of these wines is "best" would be silly, they are just simply three exquisite, but different, expressions of the terroirs of Vouvray. Three Stars. The wines of the Savoie are under appreciated. This traditional Apremont is a nice example of the freshness and simple beauty the region can produce. These are not wines of power and depth, rather, they are like a breath of fresh mountain air, refreshing your mind and spirit. If I have to describe it, it has an almost Sauvignon Blanc like gooseberry hint along with something like waxy gewurztraminer with rose petals and lychee. The first sip is akin to mountain spring stones and fresh air, light, airy and fresh. It is simple, but very pure. A mountain stream of rock filtered water, melon and citrus acidity. Very pretty and about as refreshing as you can get. One Star Plus. 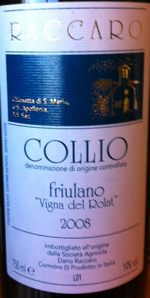 This Italian grape had been previously known as Tocai Friulano but is not just called Friulano. So it shouldn't be confused with Tokaji (pronounced Tokai or Tokay) which is from Hungary and made from the Furmint grape. This example, as most do, come from the hills in the north of Italy in Collio. This is a single vineyard wine, made by a wonderful producer in the region. This is classy, with a restrained yet aromatic nose of citrus and oyster shell minerality. It is very pretty and refined, nothing jumping out to demand your attention, rather acting lithe and subtle, forcing you to dive in to get to know it. A supremely elegant minerality defines the flavors. But it isn't an obtuse minerality that obstructs everything else. Rather, its a finely layered component of the wine that supports and accents all the other components. The medium bodied fruit is subtle, fine and silky. This wine is not cheap. But its value is in how fine and elegant it is. It isn't a powerhouse that grabs you by the balls, it is a quiet and subtle seduction that slowly grows on you. Two Stars. I've come across a lot of great 2009 Beaujolais already. It is a great vintage for that region and many of the wines, particularly the Grand Cru wines, deserve your attention, particularly considering the relatively low prices for most Beaujolais. 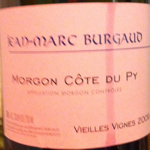 This wine is from Morgon and is not your typical, entry-level, beginner's, bubble-gummy Beaujolais. In fact, this one is a bit hard to understand at first. The aromas that first great you are pretty intense, but may even be off putting to some. There is an intense iron minerality that could be described as blood. There is ripe fruit aromas there as well but in the mouth this is a lean, mean, fighting machine. The minerality of the nose continues onto the palate where this is tight, mineral and austere. This is not a fleshy, generous Beaujolais, demanding a bit more coaxing to show you its goods. The texture is fine and silky, but this won't win any flirtation contests. Because of the ripeness of the vintage, there is just enough fruit to stand up to the taut structure. This may merit a higher score in the future if it softens just a hair and becomes a bit easier to cozy up to. For now I'll give it One Star Plus. I'm a fan of Charbonniere's wines. They tend to have a traditional feel, emphasizing the natural fruit flavors of each terroir rather than flashy oak or other manipulation. Yet they aren't foreboding or unapproachable, often having a seductive texture to them not unlike a red Burgundy. 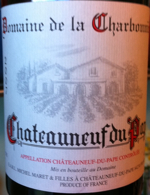 This is their basic Chateauneuf, not one of their single parcel bottlings. Whereas in a lesser vintage the basic Chateauneuf might now be as interesting, 2007 was a great vintage in the area and this is quite full and ripe with a pleasant earthy meatiness to give it complexity. The flavors are fully bodied, ripe and flavorful. It has a bit less depth and complexity than their special bottlings, but it is also less expensive. 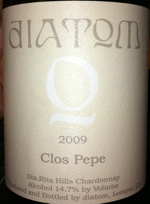 Very Grenache bright red fruits with some brambly complexity. This is a fleshy, fun Chateauneuf to drink over the next several years while you are waiting for the bigger wines to mature. One Star Plus. This red from Spains Navarra region is 70% Tempranillo, 25% Garnacha and 5% Cabernet Sauvignon. With its high percentage of Tempranillo, you might expect this to taste like a Rioja. However, I found this wine to be almost more like an Italian Sangiovese in character. It has a dusty bright red fruit aroma and flavor which evokes Chianti. It is dry, with a firm grip in the mouth. This isn't a super ripe, jammy wine like many of the newer styled Spanish reds can be, but rather is a very food friendly example that really demands a plate of food. It is flavorful, yet restrained and firm. A good value. One Star Plus. Clos la Coutale is a good value for traditional, dark red wine with a firm spine. 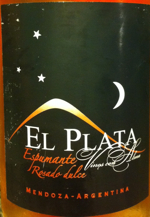 Made from a blend of mostly Malbec, it is almost always darker and firmer than its meager price tag would make you think. However, although dark and firm, it is rarely a tremendously complex wine. This is a good vintage with the typical hesitant, dark, dusty black fruits on display. The flavors are firmly in the spicy, peppery black fruit category with swirls of smoke to give it complexity. It is, like it usually is, somewhat simple and monolithic but with its typical charming rustic character. A good steak or duck wine that won't break the bank. One Star Plus. 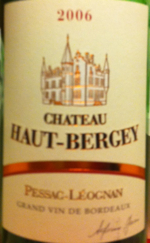 This is a relatively inexpensive red Bordeaux from the left bank in a famous region of Graves called Pessac-Leognan. 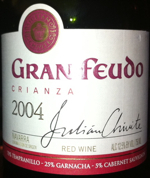 I find the reds of Graves to have a certain minerality and austerity to them that this wine displays. It has that classic nose of pencil lead shavings and cassis. While what is there is classic in character, it is somewhat one dimensional. What is there is pleasant. The fruit flavors are ripe but tannic and very black in character, with an underlying pencil lead and graphite minerality that runs the length of the wine. Not terribly complex or long, this is a simple Bordeaux but what it has represents the area and its terroir well. For that I give it One Star. Grignolino? What the heck is that? 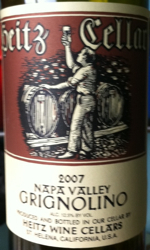 Often mispronounced, it sounds like "Green-o-lean-o", Grignolino is obviously an Italian varietal but it is not that widely planted. Most commonly found in the Piedmont region, Heitz has been making a New World example for years. You can think of it as the antithesis of their structured, masculine Cabernet Sauvignons, this is typically a very fruity, fresh, fun and easy drink that wins many over with its fruity freshness. As is typical, the nose of this is quite aromatic. It jumps out of the glass but isn't what you'd likely expect from a red wine. It almost tends more toward the white fruit end of spectrum with floral notes, citrus peel and tropical fruits. 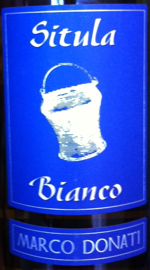 It smells sweet, almost bearing a resemblance to Moscato d'Asti or other similarly fruity and floral wines. In the mouth it is not sweet but is definitely ripely fruity and also unique. It does have a bit of similarity to something like Gamay or Dolcetto with its fruity freshness but has its own unique inner mouth perfume of rose petals and orange zest. This is a unique wine that is fun and a pleasant diversion from what you might expect from red wine, particularly California red wine. It is never going wine any power or aging contests, but it is fun and fresh. One Star Plus. Monastrell is the Spanish name for Mourvèdre, the dark, thick skinned variety found in many wines from the south of France, most notably Bandol but also a part of the blend in many Chateauneuf-du-Pape and others. There was recently some confusion because of a mistaken analysis at UC Davis that said it was genetically different than Mourvèdre. However, it has been confirmed that they are in fact the same grape. Serious Monastrell is thick skinned, tannic and generally produces a dark, firm, leathery wine of considerable concentration and structure. However, some produced in warm enough climates can be made in a fruitier style. This is just such a Monastrell. While it has some earthy and meaty complexity to it, the ripe fruit takes center stage. 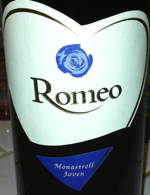 As you might expect from the name, this Monastrell is a lover, not a fighter. It is juicy and easy to appreciate, not a big, powerful wine for aging. Enjoy it now with food. One Star. I gave an overview of the domaine and wines of Tempier back in Issue 16. Following on the heals of the fantastic 2007 vintage, this is my first taste of the 2008 reds. 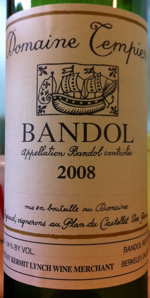 The Cuvée Classique is what people call their basic Bandol, although it doesn't say it anywhere on the label. It is a blend of fruit from around the appellation including domaine owned vineyards near the Peyraud family home and winery. This is a classically structured wine that is a glimpse of what winemaking must have been like many years ago. It is initially very hesitant, only giving up glimpses of dark earth and black fruits. It literally took several hours in a decanter to start to open up to reveal more Provencal spice, reglisse, pepper and herbs that are pure and pretty. It is not at all over ripe, in fact, this vintage seems to be more on the discrete and understated side. There is a firm tannic spine beneath the dark, blackish fruit flavors with brambly, spicy accents that make this a firm, unyielding wine, yet not a powerhouse. It is austere and classic, not a big flashy "modern" and ripe vintage. Think more on the classic Bordeaux, mineral, iron and dark fruit end of the spectrum. Still tight, even after lots of air, it has a crisp and snappy back end. This won't win as many immediate fans as the 07 because that wine was riper, fleshier. But for those with patience, this is a worth wine to sock away in the cellar for some years. It is good now, but will likely blossom with many more years in a cool cellar. With decanting, the ripe dark and spicy fruits do make themselves known, but it takes some time. Two Stars.